When someone is suffering from back pain, their employer’s first reaction may be to send them to a physiotherapist or osteopath. But new research into the causes of back pain suggests this may not be the best solution. The answer may be to make their job less stressful. Simply tackling the root cause of back pain could cut absentee rates, since it addresses two of the most common causes of lost working time in the UK. The voluntary organisation Back Pain has found that almost half the adult population in the UK reports lower back pain lasting for at least 24 hours at some time each year, and the healthcare costs are estimated to be more than £1bn a year. Meanwhile, the Health and Safety Executive reports that about 420,000 people believed that in 2004-05 their work was so stressful that it made them ill.
Now evidence is emerging that these two common causes of absence from work are linked, and that stress may be a cause of back pain. Equally, many cases of back pain and musculoskeletal injury are exacerbated by workplace stress. John Sarno, a physician and professor of physical medicine at New York University, recently highlighted the causal link between stress and back pain, which he calls ‘tension myositis syndrome’. Accepting that psychological conditions and back pain are linked has important implications for treatment. But more importantly for HR and OH professionals, it should also be easier for employers to take pre-­emptive action by assessing the degree of stress staff face, as well as making their immediate working conditions as safe as possible. “Employers can help by trying to look at the context staff are working in, rather than looking at back pain in isolation,” says Rory Murphy, head of commercial at employee assistance provider First Assist. “Lifting something heavy or sitting slumped at your PC might be the trigger for back pain, but this is also a symptom that other things are wrong. And employers should also take it seriously – there is a tendency to think that people who complain about their bad backs are moaners,” he adds. The destructive nature of stress is borne out by research at Ohio State University, which found that people with certain personality types may increase their risk of back injury if they experience workplace stress. Researchers tested the reactions of 25 college students who were criticised while being supervised as they lifted boxes. Students who were distressed by the criticism used their muscles in ways that might lead to injury over time. One theory put forward by the academics is that some people under stress actually move differently while they are working. They found that while those with more outgoing personalities were more likely to take stress and criticism in their stride, those with introvert personalities responded to stress by tensing up and using their muscles differently. This leads to ‘spinal compression’, which can result in back injury if sustained for a long time. So, any initiative to cut stress levels should also produce fewer cases of back pain – and alleviate the suffering of people already affected. HR teams have been criticised in the past for introducing ‘gimmicks’ such as head massages for staff, but this is exactly the kind of approach that could cut down the number of working days lost to back pain. And, Murphy says, if HR can give staff the message that their working conditions and general morale are being monitored with a view to improving them, this in itself can alleviate feelings of anxiety and stress. “Back pain is a symptom of things being wrong. If an employee gets the message that their employer is taking this seriously, not only is their back likely to improve, their stress levels may be reduced too,” he says. Almost 600 people have been tested for exposure to the radioactive substance Polonium-210 in the wake of the poisoning of Russian spy Alexander Litvinenko, said the government’s Health Protection Agency. Of those, 480 had results “below reporting level” so are unlikely to have been exposed. Results from a further 103 showed probable contact but at such low levels as to represent no health risk. The government is to fund a series of pilot workshops around the country, intended to teach GPs more about workplace ill-health and to improve their ability to communicate with employers. The pilot projects are expected to run during May or June, and will then be evaluated. If they are deemed to have been a success, the workshops could then be rolled out to the whole of the UK. Workers in Wales are more likely to be ill and have to take time off work than those elsewhere in the UK, a survey has found. The report, carried out by market researchers CACI and TNS, found that eight of the sickest places in Britain were in south Wales. The report suggested that poverty was the key factor in sickness and absence levels, with former industrial areas like Merthyr Tydfil coming highest. 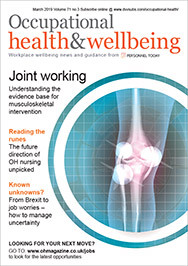 Special report on rehabilitation after long-term sickness absence. Personnel Today’s sister publication, Occupational Health, is a monthly magazine dedicated to keeping you on top of occupational health issues. Click here to subscribe, or call 01444 445566.